Growing up on a beef farm, we ate beef for dinner almost every night. I know that I took my family’s hard work on the farm for granted, especially when I was a self important teenager, and that I always thought beef would be accessible to me. Being a farm kid in the eighties wasn’t easy, nor was it a great time for farmers. My dad ended up having to sell the business he had grown up with and that he loved so much. He worked away from home after that, and our family life changed dramatically. I’m proud to say that our family farm was still carried on by my uncle who faced some important decisions at the time my dad had to sell his portion. He ended up becoming one of the first bison ranchers in Saskatchewan at a time when most people were auctioning everything off or downsizing. No matter what, he has always kept a few head of cattle so that both of our families had a freezer full of quality, grass fed, farm raised beef. Today my family eats beef maybe 3 times a month at the most. I just don’t like buying it in stores because it somehow is never the same as the beef I had growing up. I feel like I never know how to choose a quality cut and that I am surprisingly fairly limited with knowledge of which cuts require what sort of cooking time. 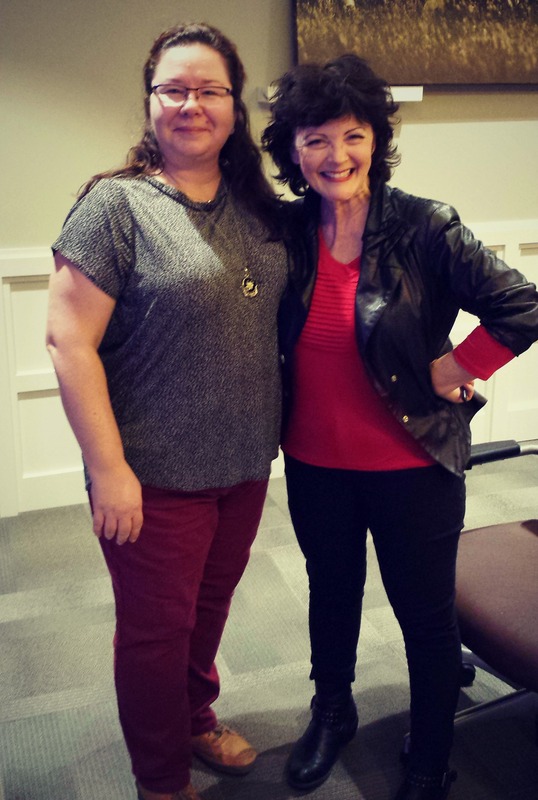 So, I was very pleased to get another invitation to visit the Canadian Beef Centre of Excellence for the launch of Mairlyn Smith‘s newest cookbook, Homegrown, which celebrates many of the Canadian foods grown, raised, and produced in our bountiful country. The event included a tour of the facility, lessons in the various cuts of beef and how to use them, a small butchery demo from butcher Abe Van Melle, dinner featuring recipes from Homegrown using Canadian beef and other locally produced ingredients like Highwood Crossing cold pressed canola oil and locally grown barley. Canadian wines were well represented too, as we had a VQA (Vintner’s Quality Alliance) pairing with each course at dinner. The Canadian Beef Centre of Excellence was built to provide education, training, research and development, and to serve as an outreach facility to those who want to learn more about Canadian beef. They have had delegates from many countries come to Alberta just to tour the facility and learn more about our favourite red meat. Centre Technical Director, Abe Van Melle gave us a tour of the beef fabrication room with all the meat cutting equipment and later led us though a butchery demo in the demonstration theatre. Having the Homegrown cookbook launch at the Canadian Beef Centre of Excellence was ideal because they work with and promote local beef producers. 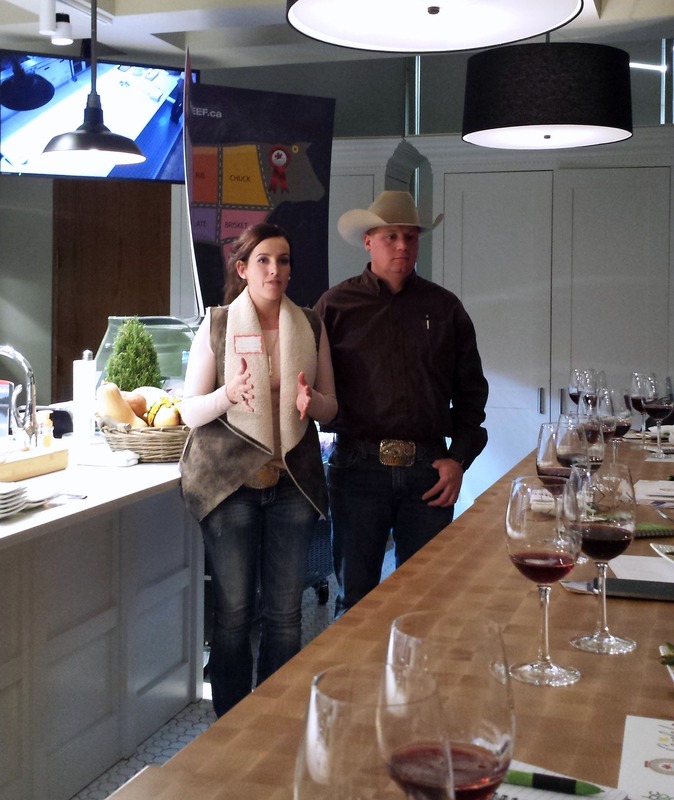 For the event, we had beef provided by Jill and Cole Harvie (HarvieRanching.com) who raise beef on their family farm just north of Calgary. Our first course at dinner featured the Harvie’s cross rib simmering steak and locally grown barley which has been shown to lower cholesterol. Mairlyn first browns the beef in canola oil, then lets it cook in the slow cooker for 4-5 hours on high or 8-10 on low. Then we had the star of the show…the Strip loin roast with cracked pepper horseradish crust, pan gravy, and green beans. This perfect, melt in the mouth beef was served with a delicious Yorkshire pudding. I was excited to find the recipe in Mairlyn’s cookbook and I love that she included one of her own grandmother’s recipes in the book. She claims it is a ‘no fail’ recipe so I am going to have to test it out! I got some great roasting tips here…always use an electronic thermometer and be sure to take the roast out 5-7 degrees before it reaches the desired final temperature because the large piece of meat continues to cook during the resting period. 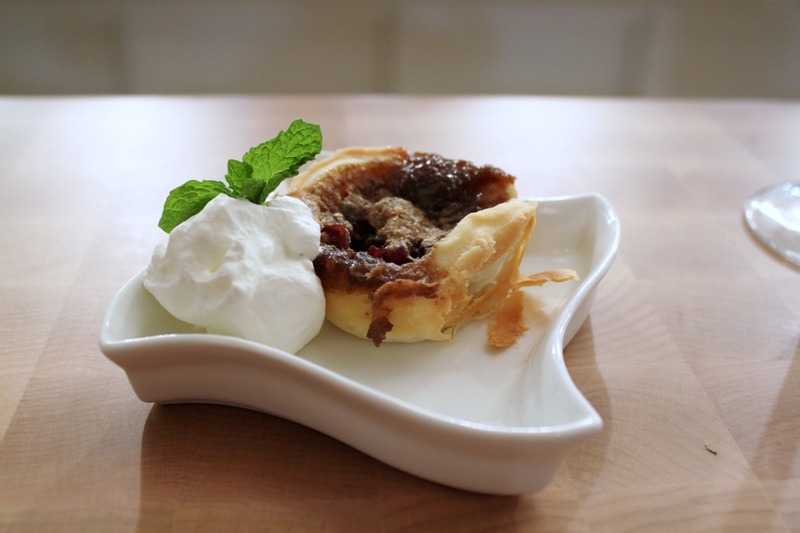 The sweet grand finale for a very Canadian cookbook launch could be none other than a butter tart. Mairlyn used the ‘never fail’ cream cheese pastry recipe from her book and added cranberries and maple to add a festive flavour. 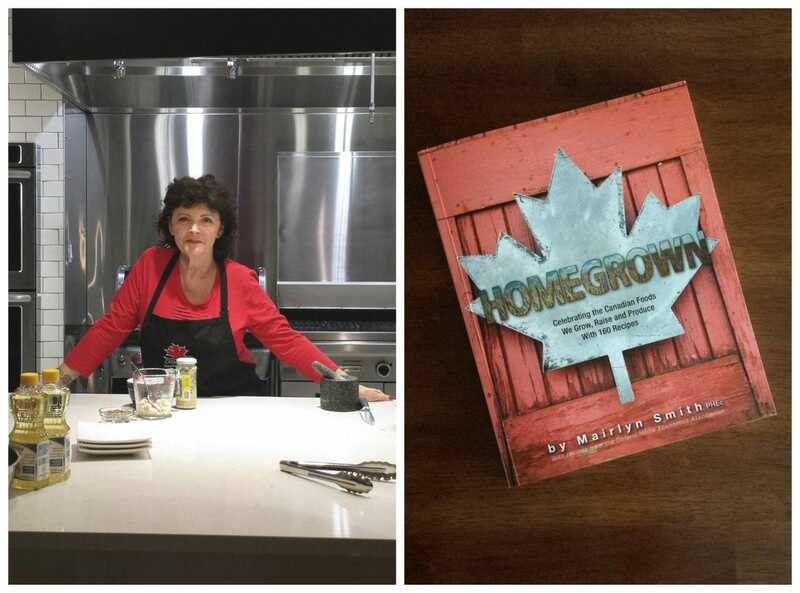 If you want to learn more about eating locally grown, raised, and produced Canadian food, picking up Homegrown by Mairlyn Smith is a great place to start. Give this Beef ‘n’ Barley Stew a try and enjoy the best food our country can offer. Trim any excess fat from beef and cut any large pieces into smaller pieces. Heat 1 tsp canola oil in a large skillet over med-high heat. Cook beef until browned (in 2 batches if necessary) and transfer to slow cooker. Add remaining oil to skillet and add onion, carrots, and garlic; cook a few minutes until just softened. Stir in barley, broth, tomato paste, brown sugar, vinegar, salt, thyme, and pepper. Bring to a simmer, then pour into the slow cooker. Cover and cook on low heat for 8-10 hours (or on high heat for 4-5 hours), or until the beef and barley are tender. Turn off slow cooker, stir in peas and let stand for 10 minutes to heat the peas.